Ultrasound Technicians work in a variety of capacities. Most include hospitals, private imaging centers, colleges, and even manufacturers of lab equipment. 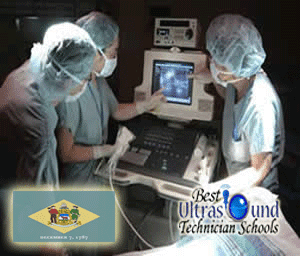 Delaware provides a strong network of sonography professionals. Delaware Technical Community College offers an associate's degree in Diagnostic Medical Technology. The program offers a core curriculum that includes a blend of core sonography curriculum, medical knowledge, and applied liberal arts for a well-rounded degree. There is a 15 to 1 student to faculty ratio, providing a tight-knit program for learning.Coursework typically include a background in medical terminology, anatomy, and physiology. Each semester contains a clinical component coupled with practical requirements in all areas of medical diagnostics. Georgetown and Wilmington offer the large Diagnostic Medical Sonography program at Delaware Technical Community College. Georgetown is located in the southern part of the state close to Delaware Seashore State Park. Wilmington is located close to the heart of Philadelphia, PA and the Delaware River. Although the choice of local certification is smaller for this state, Delaware offers an extensive network of professionals that are linked between Maryland and Pennsylvania. The alumni network for Delaware Technical Community College is extensive and includes graduates working in all capacities related to sonography. Additional credentials can be obtained after graduation through the American Registry for Diagnostic Medical Sonography (ARDMS). This will provide more opportunities for continuing education and professional support. It also provides additional research and job opportunities within hospitals. In fact, many insurance providers will only reimburse for procedures by a certified sonographer or medical technician. As a result, most hospitals and imaging clinics that deal with patients will require full certification. According to the Department of Labor Statistics in Delaware, job growth has a steady 40% growth rate in the healthcare field. The annual salary of a technician is approximately $66,740. This is the average salary for the state and will be adjusted depending on the city and capacity of work. Nationally, the Bureau of Labor Statistics also predicts a 39% increase in job outlook as well as an average salary of $60,350 per year. In 2012, there was a report of 110,400 jobs and a change of workers is predicted annually at 42,700. If you have the coordination, interpersonal skills, and technical aptitude, here has never been a better time to become an Ultrasound Technician.